Join Us!!! We are looking for someone to help us cover Mali basketball. Please send us an e-mail. AS Police remain undefeated in the League as they improved to a 9-0 record. In the latest game they edged USFAS 75-58 at the Palais des sport Salamata Maiga. Stade is second with a 6-3 record as they edged Attar in the thriller 66-63. The latter shares the third place with USFAS and Real with the same 5-4 records. We bring you last week's top performances from Malians who are playing abroad and who all have had prior experience of national team duties at youth or senior level. #1. This week's number one is an international power forward Nianta Diarra (203-93, currently plays in France). He managed to help Boulazac Basket Dordogne in a victory against the closely-ranked Gravelines-Dunkerque (17-9) 72-65 in the French Jeep ELITE ProA in Saturday night's game. Diarra scored only 2 points in 12 minutes on the court. 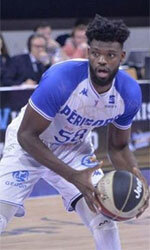 Boulazac Basket Dordogne (15-11) is placed seventh in the Jeep ELITE ProA. This year Diarra averages: 3.6ppg, 3.2rpg, 2FGP: 58.5%(31-53), 3FGP: 25.0% and FT: 48.1% in 26 games he played so far. He has a dual citizenship: Mali and French. Diarra is currently a member of the Mali senior national team. #2. Second place goes to an experienced former international guard Ludovic Chelle (188-83, currently plays in France). He could not help Saint Vallier (6-7) in their last game on Saturday. Despite Chelle's good performance the sixth-placed Saint Vallier (6-7) was edged 85-84 on the road by the second-ranked STB Le Havre in the Places 1-10 group. He scored 14 points (was perfect 5-for-5 from the free throw line). Chelle's overall stats this season are: 9.7ppg, 2.0rpg, 1.3apg, 2FGP: 41.2%, 3FGP: 41.7% and FT: 75.0%. He is another player who holds two passports: Mali and French. Despite Chelle played previously for the French U20 national team, he played also for the Mali national team in 2011. #3. The Mali player who performed third best last week abroad was an international center Boubacar Sidibe (205-94, currently plays in Spain). He contributed to a HLA Alicante's victory against the sixth-ranked Estela (15-15) 76-68 in the Spanish LEB Silver (third division) in Sunday night's game. Sidibe scored only 2 points and grabbed 5 rebounds. HLA Alicante (25-5) is placed first in East group. There are only four games left until the end of the Regular Season. So now every game will be critical. Sidibe's overall stats this season are: 3.3ppg, 2.8rpg, 2FGP: 63.9%(23-36) and FT: 70.8%. He is also a member of the Mali senior national team. #4. Shooting guard Mahamadou Drame (188-86, currently plays in France) was not able to help Feurs EF (4-9) in their last game. Despite Drame's good performance Feurs EF (#8) was edged 82-79 in Angers by the second-ranked Etoile in the Places 11-20 group. He scored 12 points in 25 minutes. It was Feurs EF's sixth consecutive loss in a row. There are only three games left until the end of the Second Stage. So now every game is very crucial. This year Drame's overall stats are: 9.2ppg, 2.9rpg, 1.9apg and 1.2spg in 17 games. He has both Mali and French nationalities. Drame is also Mali national team player. #1. Nouhoum Bocoum (208-F/C-92, college: Arkansas St., currently plays in Spain) could not help Aridane (8-20) in their last game. Despite Bocoum's very good performance Aridane (#13) was crushed 86-64 on the road by the much higher-ranked (#6) Rivas in the Group B. He was the top scorer with 23 points. Bocoum also added 9 rebounds in 27 minutes; quite an impressive performance considering it's only his third season in pro basketball. It was Aridane's sixth consecutive loss in a row. There are only two games left until the end of the Regular Season. So now every game will be critical. Bocoum has individually a very good year with high stats. He averages: 18.5ppg, 9.9rpg and 1.4apg in 27 games he played so far. Bocoum has a dual citizenship: Mali and American. #2. Bakary Konate (211-C-93, college: Minnesota, currently plays in Spain) was not able to help Caceres Basket in their game against Ourense (19-12) in the Spanish LEB Gold (second division). He did not beat the league record on Friday evening. Konate recorded only one point. Caceres Basket was edged 83-80 on the opponent's court by the higher-ranked Ourense (#5). There are only three games left until the end of the Regular Season. So now every game is very crucial. Konate's total stats this season are: 1.6ppg and 2.0rpg. Notice: The list above includes only some of the Mali playing currently abroad. Go to Mali Abroad Page to see completed list. #1. This week's number one is former U16 international power forward Cheick Diallo (206-96, college: Kansas, currently plays in NBA). He could not help the New Orleans Pelicans (33-49) in their last game. 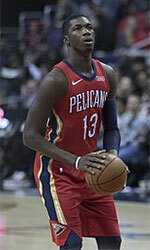 Despite Diallo's good performance the New Orleans Pelicans (33-49) lost 126-133 on the road to the Phoenix Suns. He had a double-double by scoring 12 points and getting 11 rebounds in 23 minutes on the court. The Regular Season already ended in the NBA. This year Diallo averages: 6.0ppg, 5.2rpg, 2FGP: 62.5%(167-267), 3FGP: 25.0% and FT: 74.6% in 64 games he played so far. He played for the Mali U16 national team eight years ago. #2. Second place goes to an international center Boubacar Sidibe (205-94, currently plays in Spain). Sidibe was the major contributor in a HLA Alicante's victory against the sixth-ranked Zornotza (15-14) 71-57 in the Spanish LEB Silver (third division) last Friday. He scored 14 points, grabbed 7 rebounds and made 3 blocks. HLA Alicante (24-5) is placed first in East group. Sidibe's overall stats this season are: 3.4ppg, 2.7rpg, 2FGP: 67.6%(23-34) and FT: 68.2%. He is in the roster of the Mali senior national team. #3. The Mali player who performed third best last week abroad was an international power forward Nianta Diarra (203-93, currently plays in France). Diarra managed to help Boulazac Basket Dordogne in a victory against the closely-ranked JSF Nanterre (12-14) crushing them 90-68 in the French Jeep ELITE ProA on Tuesday night. He scored only 4 points in 10 minutes. Boulazac Basket Dordogne (14-11) is placed seventh in the Jeep ELITE ProA. It's Diarra's first season with the team. This year Diarra's overall stats are: 3.6ppg, 3.2rpg, 2FGP: 57.7%(30-52), 3FGP: 27.3% and FT: 48.1% in 25 games. He has a dual citizenship: Mali and French. Diarra is also a member of the Mali senior national team. #4. An experienced guard Ludovic Chelle (188-83, currently plays in France) led Saint Vallier to an easy victory against the tenth-ranked La Charite (2-11) 85-70 in the French NM1 (third division) in Saturday night's game. He recorded 12 points. Saint Vallier Basket Drome (6-6) is placed fifth in Places 1-10 group. It was his team's fifth consecutive victory in a row. Chelle's total stats this season are: 9.6ppg, 2.1rpg, 1.4apg and 1.1spg. He is another player who holds two passports: Mali and French. Despite Chelle played previously for the French U20 national team, he is currently in the Mali national team roster. #5. International point guard Ibrahim Saounera (179-87, currently plays in France) was not able to help Lorient (6-1) in their last game. Despite Saounera's good performance the first-placed Lorient (6-1) was crushed 87-65 at home by the lower-ranked (#5) Recy Saint-Martin in the Places 21-28 group. He recorded 11 points, 5 rebounds and 8 assists in 31 minutes. There are only two games left until the end of the Second Stage. So now every game will be critical. Saounera has relatively good stats this year: 13.1ppg, 2.9rpg and 4.2apg in 28 games. Similarly like Chelle and Diarra above he has both Mali and French nationalities. Saounera plays currently for the Mali national team. #6. Shooting guard Mahamadou Drame (188-86, currently plays in France) was not able to secure a victory for Feurs EF (4-8) in their game against Vitre (7-5) in the French NM1 (third division). He recorded 8 points in 21 minutes. Feurs EF (#8) lost 66-70 on their home court in Feurs to the higher-ranked (#4) Vitre in the Places 11-20 group. It was Feurs EF's fifth consecutive loss in a row. There are only four games left until the end of the Second Stage. So now every game is very crucial. This year Drame's total stats are: 9.0ppg, 3.0rpg, 1.9apg and 1.1spg in 16 games. He is an international player who is currently on the senior Mali National Team roster. #1. Bakary Konate (211-C-93, college: Minnesota, currently plays in Spain) managed to help Caceres Patrimonio de la Humanidad to win against the eighth-ranked Palencia Baloncesto (17-13) 76-70 in the Spanish LEB Gold (second division) on Friday night. He scored only 3 points. Caceres Patrimonio de la Humanidad (9-22) is placed 16th in the LEB Gold. There are only four games left until the end of the Regular Season. So now every game will be critical. Konate's total stats this season are: 1.7ppg and 2.1rpg.